How would Jesus have us act in today's world? Living Like Jesus explores eleven basic yet profound ideals that spell the difference between nominal Christianity and the incredible power of the authentic gospel. Ronald Sider challenges us to reexamine our commitment and return to the basics of faith, exploring the impact this will have on our relationships--with God, others, the church, our society, and our world. 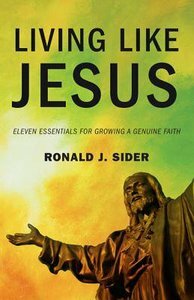 ""Ron Sider's own genuineness lends credibility to this comprehensive assessment of a summons to genuine Christianity for today. Here's a practical handbook for the fulfilling yet disciplined lifestyle we can all learn."" --Jack W. Hayford, senior pastor, The Church on the Way ""This is Sider's Mere Christianity... . Compelling."" --Christianity Today ""I am using Living Like Jesus with elders and key laypeople as a solid, practical resource for biblical teaching and living. I highly recommend it."" --Roberta Hestenes, senior pastor, Solana Beach Presbyterian Church ""Living Like Jesus bores in on and illuminates the core, what's crucial, in the well-lived-out Christian passage in today's world."" --J. McDonald Williams, chairman, Trammell Crow Company ""The author has provided an outline of what it means to be a Christian today--the sort of wallet-size gem that the reader may carry ... as an aid to prayer."" --Cross Point Ronald J. Sider (PhD, Yale) is Senior Distinguished Professor of Theology, Holistic Ministry & Public Policy at Palmer Theological Seminary, and President Emeritus of Evangelicals for Social Action. He is the author of over thirty books including Rich Christians in an Age of Hunger (1977), The Scandal of the Evangelical Conscience (2005), Christ and Violence (reprinted 2001), Saving Souls, Serving Society (2005), and I Am Not a Social Activist (2008).